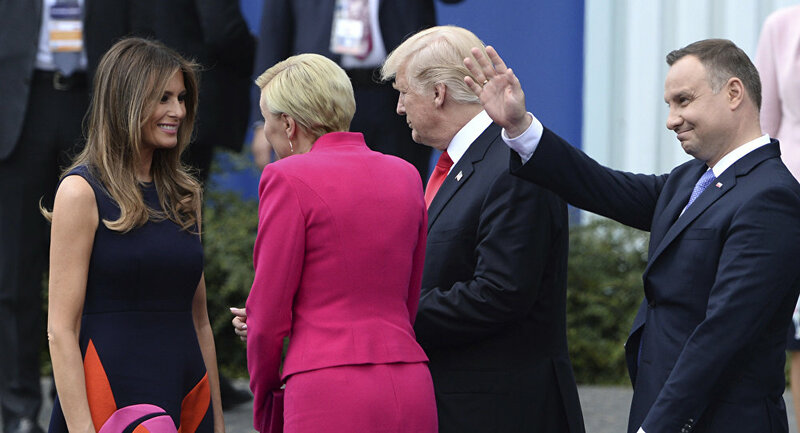 President Donald Trump is having a hard time in Poland – hardly a surprise after the country’s first lady completely snubbed his “tiny hand” at their official meet and greet. ​The horrendous mix-up occurred when the commander-in-chief met Polish President Andrzej Duda and his wife, Agata Kornhauser-Duda, for the official welcome ceremony, during which both first couples grasp each other's hands and pose for the camera. And if we’re being honest, should we have expected more on his visit? According to the internet, it’s a hands-down no. Trump watchers have been anticipating social and diplomatic faux pas, and luckily for them, Trump delivered. ​For some, the misfire was reminiscent of a soccer game, and, well, Poland apparently won this round. ​Could it be possible that the queen of handshake snubs just didn’t see POTUS’ little hand? ​Some are chalking Agata’s diss up as a “woman thing,” saying she just decided to greet First Lady Melania Trump before turning to the Donald. ​Others, perhaps not wanting to rain on Trump’s parade, don’t see a diss at all. ​While the jury is still out on the social crime, it’s safe to say that yet another awkward greeting has been added to this president’s growing list. Here’s hoping his handshake with Russian President Vladimir Putin won’t be a complete blunder.